Blogland is full of lists- Best gifts for travelers! Best gifts for boys aged 7-12! Best gifts for dad! 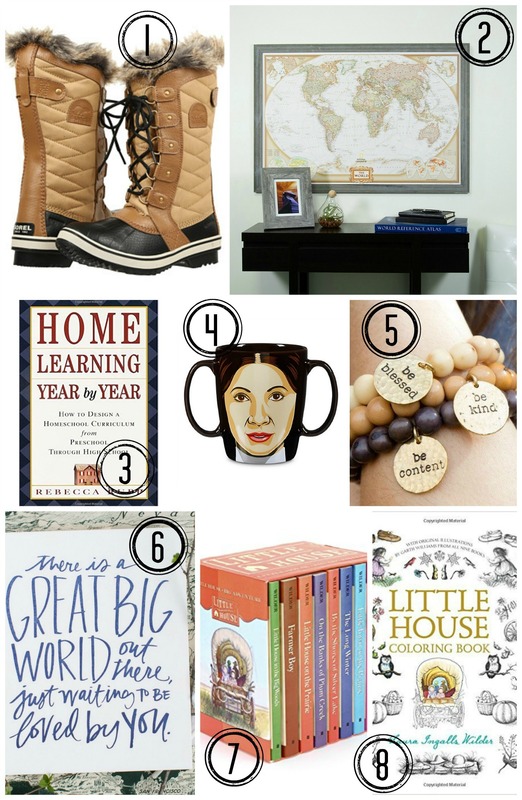 This is the list titled– Best Gifts for Leah Yoder — fully egocentric and very specific. Friends, since I can’t have a 10-day Pacific Islands cruise with my family (and a nanny), I’ve resorted to a traditional list. I wrote this for 2 reasons. Because I want to know what you want. So that’s your job in the comments. So here’s my list. Some of affiliate links (no cost to you, but the 20 cent commission may help Mr YT afford my taste in boots)! #1- I love these boots. We’re moving to the snowbelt and my Uggs are not going to handle the wet snow. I just wish I’d had these in Canada. #2- I’ve been wanting a functional world map- good for school and décor. This one I found on Amazon takes the cake, and it comes with push-pins to mark where you have been! #3- I’m a homeschool mom, and I’ve gotten this book from the public library more than once. I think it’s probably time I buy it for our home library. #4- I was born in 1983, right around the time Return of the Jedi hit the big screen. So our names aren’t quite the same, but I still adore this mug! #5- These beatitude bracelets by Mercy House Global are perfect. I love the message- and I love that they support impoverished women. I subscribe the Earring of the Month club- check it out. #6- Have you seen prints by Lindsay Letters? I’m thinking this one would be perfect for a gallery wall in the new homeschool room. #7 & #8 We’ve started the Little House series for our read-aloud time of homeschool. Through that, I realized that it would be helpful if our family had a set of our own (instead of having to renew it multiple times)! I saw the Little House coloring book at T.J. Maxx and it is GORGEOUS, but I was too cheap to buy it ($10 for coloring?) However, this could be 3 pm therapy for me and the littles! Lol. So what’s on your 2016 Christmas list? Boots? Jewelry? A nanny? A turkey baster? That’s a great wish! You should look into the cheap airfare through Norwegian air. I think it’d be easy peasy for someone flying without all the kid crap.